Dizzying! 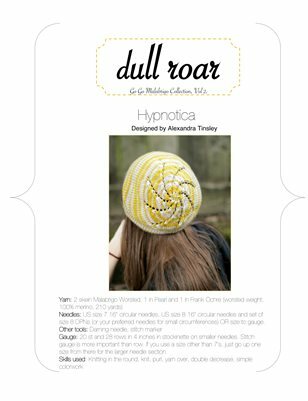 This hat features a short introduction to simple colorwork (in the form of corrugated ribbing) and then a terribly easy stripe pattern that looks a lot fancier than it is. A small change in gauge encourages a touch of slouchiness, but you could enhance that by blocking as well. Decorative yarn-over decreases swirl around the crown- combined with the stripes, it looks a bit like a hypnosis spiral. I think if you spin around fast enough, this hat could hypnotize birds and low-flying aircraft. I don’t recommend it, though.